The Sony Vaio’s capacity for empowering the individual is highlighted in “Projections”, a television commercial from Australia, directed by Dael Oates from Prodigy Films for Saatchi & Saatchi Sydney. A young man in a taxi taps away on his VAIO notebook as a projected robot runs unnoticed on cityscapes alongside his cab. 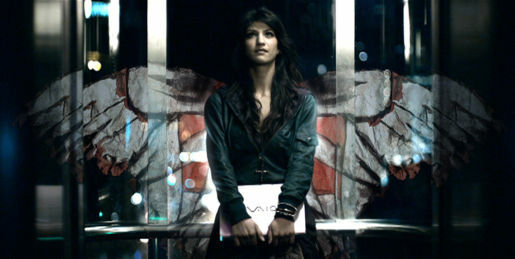 A woman with a VAIO SR series in her bag is unware of the beautiful butterfly wings projected onto the glass elevator behind her. As the elevator stops, the wings flap together and explode into dozens of small butterflies. A confident businesswoman strides into a building and on the wall behind her, we see her projection and the images of an army coming into frame as if following her into battle. 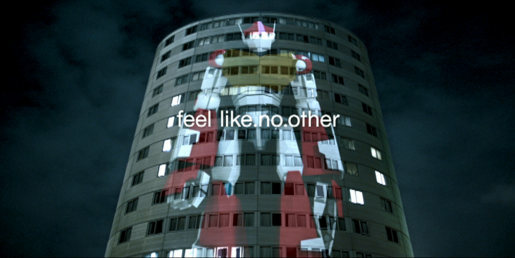 The Sony Vaio Projections ad was developed at Saatchi & Saatchi Australia, Sydney, by executive creative director Steve Back, creative director Dave Bowman, creatives Vince Lagana, Steve Jackson and Nic Buckingham and agency producer Julia Jackson. Filming was shot by director Dael Oates via Prodigy Films with director of photography Duncan Cole, art director Ross McGarva, executive producer Jonathan Samway, and producer Caz Hearn. Post production was done at Oktobor, Auckland. Editor was Phillipe Lods at 30 Second Films, Auckland. Oatesʼ use of projector light and realistic source lighting contributes to the sophistication of the spot. Photographically, it is an exploration of natural light at night. The projected images, a light source of their own, have become part of the subject in the night landscape. Oates was recently recognized as new director to watch by Shots, with his work broadcast at Shots Evolution in Sydney. His recent credits with Prodigy include Change The World (Y&R Wellington), Butter Menthol (Singleton, Ogilvy & Mather), BigPond Sushi Train (Belgiovane Williams Mackay), Milo B Smart (Singleton, Ogilvy & Mather), and Yahoo!7 (Singleton, Ogilvy & Mather).